The Ambassador of the Kingdom of Bahrain to the Republic of Croatia, residing in the Russian Federation, Ahmed Abdulrahman Al Saati, met today in Zagreb with the Assistant Minister for Political Affairs at the Ministry of Foreign and European Affairs of the Republic of Croatia, Mr. Vice Skračić. During the meeting, the two sides discussed the bilateral relations between the two countries in various fields and means of enhancing them and developing them for the common interests of the two countries and friendly peoples. Ambassador Ahmed Al Saati also met with the State Secretary at the Ministry of Tourism of the Republic of Croatia, Mr. Tonči Glavina. During the meeting, the two sides hailed the distinguished relations of friendship between the Kingdom of Bahrain and the Republic of Croatia, reviewing ways to enhance and develop their bilateral relations in the field of tourism, for the common benefits of the two countries. 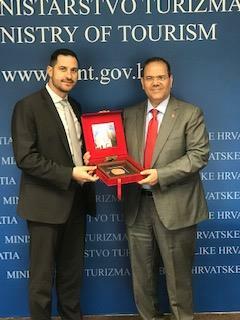 In addition to that, Ambassador Ahmed Al Saati met with President of the Croatian Chamber of Commerce, Luka Burilović. Mr. Luka Burilović expressed his pride and appreciation for the relations of friendship between the Kingdom of Bahrain and the Republic of Croatia, stressing the keenness of Croatia to bolster its bilateral relations with the Kingdom of Bahrain in various fields, namely commerce and economics, for the common interest of the two countries and peoples.